F-GZCP, the airplane that crashed, at Charles De Gaulle Airport in 2007. Air France Flight 447 was a scheduled commercial flight from Rio de Janeiro, Brazil, to Paris, France. The aircraft used was an Airbus A330 jet. On June 1, 2009, the A330 crashed into the Atlantic Ocean, three hours and 30 minutes into the flight, killing all 228 people on board. Air France Flight 447 is currently the deadliest plane crash in Air France's history. It is the deadliest plane crash in the 21st century since the crash of American Airlines Flight 587, which occurred on November 12, 2001. F-GZCP was an Airbus A330-203.It has two General Electric CF6-80E1A3 engines.It was delivered new from Airbus, after having its first flight on 25th February 2005, and at the time of accident, it has flown for 18870 hours, taking off and landing 2644 times. Nationalities shown are as stated by Air France on 1 June 2009. Attributing nationality was complicated by the holding of multiple citizenship by several passengers. Passengers who had citizenship in one country but were attributed to another country by Air France are indicated with parentheses (). As the flight was more than 10 hours long, there were 3 crew operating the airplane, so that each of them can take a break during the flight. The flight's captain is Marc Dubois, while the co-pilots are Pierre-Cédric Bonin and David Robert. There were 9 cabin crew onboard and 216 passengers. Air France Flight 447 took off from Rio de Janeiro International Airport for the flight to Paris at 7.29 p.m. Brazilian time. In the first part of the flight, the captain was in the left seat, while first officer Bonin was in the right seat. The third pilot, Robert, was resting in the small cabin behind the cockpit. The plane cruised at FL350, or 35,000 feet. From 1.48 a.m. onwards, the flight went out of radar coverage. From then on ATC can no longer track the flight. At 1.55 a.m., the captain woke Robert up and asked Robert to take his place. Then, at 2.08 a.m. the plane turned left due to turbulence. Just 2 minutes later, both the autopilot and the auto thrust switches off. Bonin, in response, said,"I have control." before raising the plane's nose up and causing the plane to climb. Robert noticed this and asked Bonin to descend. Bonin then put the nose down and the plane no longer climbed as fast as how it did previously. However, the plane was still climbing. At about 2.11 a.m and 6 seconds, the plane reached the maximum altitude. The angle of attack was about 16 degrees. The plane stalled and began to descend. Throughout the whole descent, the angle of attack remained above 35 degrees when valid. The plane most likely crashed at 2.14 a.m. and 28 seconds, when all the recordings stopped. At 2:20 a.m., the Air Traffic Controller at DAKAR failed to contact Air France Flight 447, which was supposed to be in DAKAR airspace already. The controller then contacted Air France, who tried to contact Flight 447, but failed. At that time, people thought that the plane had "disappeared".Ships and planes then searched the area near the last-known position of Flight 447, and by 6th June, the first bodies have been found. The plane was confirmed to have crashed. As the search for survivors end, the search for the plane's recorders then began. Underwater Vehicles are used to detect the recorders' signals that they give out for 30 days.However, at the end of the 30 days, there was not a sign of the recorders. Other searches in 2009 and 2010 also found nothing. Then, in 2011, the search for recorders finally ended when an underwater vehicle found the Flight Data Recorder and Cockpit Voice Recorder on 26th April and 2nd May respectively.The recorders are sent to BEA(Bureau d'Enquêtes et d'Analyses pour la Sécurité de l'Aviation Civile, Bureau of Enquiry and Analysis for Civil Aviation Safety)'s headquarters for analysis and arrived on 12th May. When the pitot tubes were blocked by ice crystals, the automatic controls of the plane, including autopilot and autothrust, switches off by itself. This had surprised the pilots, even though this was a well known phenomenon. The pilots likely never understood that the only problem they had was that the airspeed was incorrect. The plane began to climb. During the whole climb to 38,000 feet, the crew failed to understand the situation. Even when the plane stalled and the stall warning sounded, the crew likely did not understand the stall situation they were in and so never tried to put the nose down and recover the plane from the stall. The plane remained stalled until impact with water. Right after the crash, Air France sped up the replacement of pitot tubes. By June 11, 2009, all the pitot tubes were changed to ones that will not freeze up when ice crystals hit them. The flight number was changed to AF 445 after the crash and is still flown by Airbus A330-200s. ↑ 1.0 1.1 1.2 "ASN Aircraft accident Airbus A330-203 São Pedro and São Paulo Archipelago".Aviation Safety.net.Retrieved 16th November 2013. ↑ Byrne, Ciaran; Kane, Conor; Hickey, Shane; Bray, Allison (2 June 2009). "Three Irish doctors die in mystery jet tragedy". Irish Independent. Retrieved 15 July 2014. ↑ "Zeisterse in verdwenen Air France vlucht" (in Dutch). rtvutrecht.nl. 2 June 2009. ↑ "Alexander kommer aldri tilbake på skolen" (in Norwegian). Dagbladet. 3 June 2009. Archived from the original on 6 June 2009. Retrieved 3 June 2009. ↑ "Violeta Bajenaru-Declerck, romanca aflata la bordul Air France 447 (In Romanian)". 2 June 2009. ↑ "Andrés Suárez Montes: Nueva vida en París". ABC (Spain). 4 August 2009. ↑ Thorsson, Eric. "Nya fynd kan lösa gåtan om deras död (Swedish) (New findings may solve the mystery of their deaths)". Aftonbladet. ↑ "The Last Recital in Rio de Janeiro". Korhan Bircan. 6 June 2009. 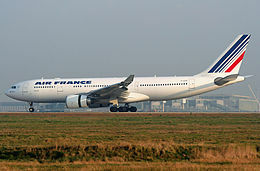 ↑ Air France (1 June 2009). "Press release N° 5". Press release. Archived from the original on 4 January 2011. https://web.archive.org/web/20110104175009/http://alphasite.airfrance.com/en/s01/press-releases/. Retrieved 8 January 2011. ↑ "Final Report. "Paragraph 1.5. Bureau d'Enquêtes et d'Analyses pour la sécurité de l'aviation civile(BEA).Retrieved 16 November 2013. ↑ "What Really Happened Aboard Air France 447. "Popular Mechanics.Retrieved 16 November 2013. ↑ "Final report." Paragraph 1.1. BEA. July 2012. Retrieved May 7, 2014. ↑ 14.0 14.1 "Air France 447: Vanished" Mayday. Season 12, Episode 13. ↑ "Final Report.Paragragh 1.11.1"Bureau d'Enquêtes et d'Analyses pour la sécurité de l'aviation civile(BEA).Retrieved 20 November 2013. ↑ "Final Report." Section 3.2. Published July 2012, retrieved May 7, 2014. ↑ "Final Report." Section 5.1.1. Published July 2012, Retrieved May 7, 2014. ↑ "Flight AF445."Flightradar24.com. Retrieved May 7, 2014. Wikimedia Commons has media related to Air France Flight 447. This page was last changed on 8 February 2019, at 16:39.